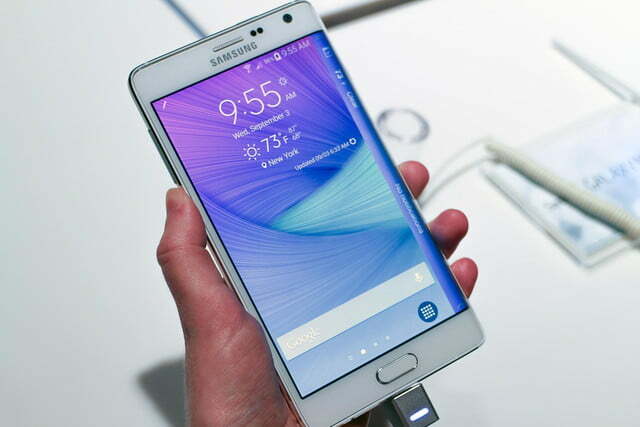 Samsung unveiled the Galaxy Note Edge at IFA in Berlin. The phablet is making waves thanks to the innovative, 5.6 inch screen that cascades over the right side of the device. The waterfall panel is designed to act like a secondary screen independent of the main display and can display a flurry of information without leaving the main page. 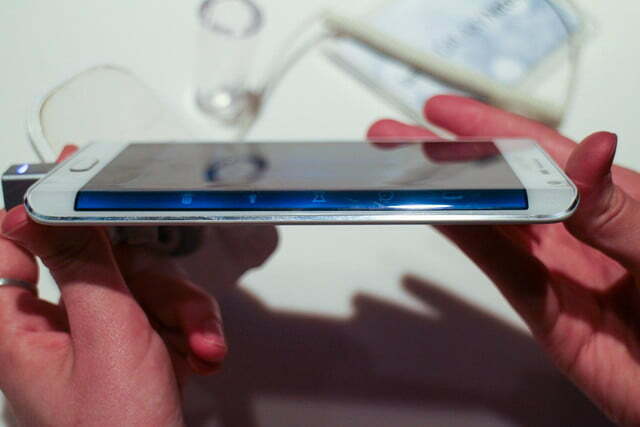 The Note Edge is expected to be released in American markets late 2014. We’ve put together a list of the nine strongest impressions previewers have formed about the Note Edge. The bezel-less display could be the way of the future. Thanks to the right panel, which functions as an secondary screen independent of the main screen, a flurry of information can be accessed without leaving the main page. A simple left-swipe will display stocks, scores, twitter feeds, and much more. The edge also serves as an “App Tray” that can stash your favorite apps in an easy to see place. That common saying, less is more, applies here. 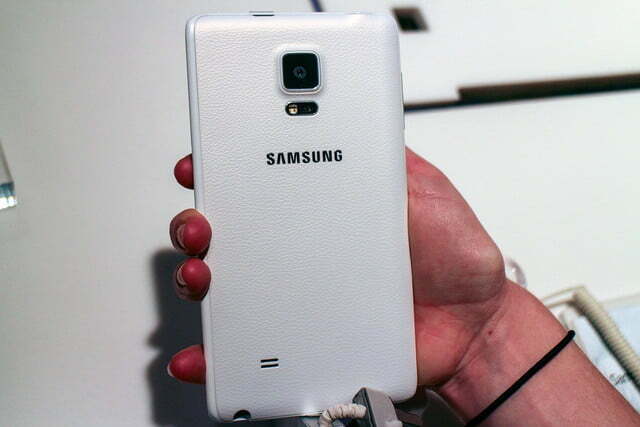 Despite the actual screen size of the Edge measuring slightly smaller than the Galaxy Note 4, you’ll feel otherwise. 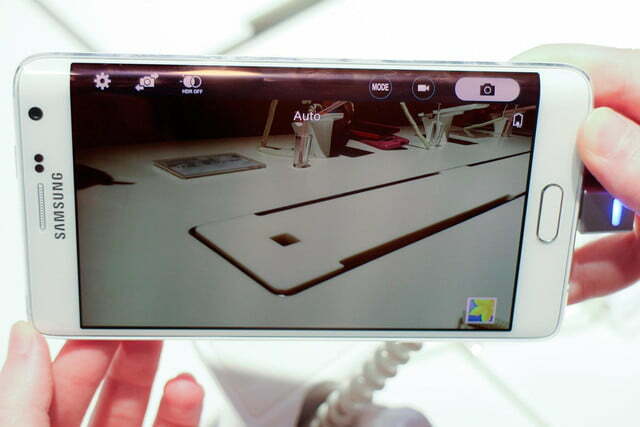 For example, using the 16 MP camera or stylus app means having the editing tools appear on the roomy the fall-away edge, rather than cramped on the screen. The same thing happens, for example, when using the Google Chrome Browser. The chrome bar is featured on the edge. The rest of the screen is dedicated to giving you more space to work with. Despite being billed as the premium Galaxy Note option, it’s still unclear if the Note Edge will catch on. We think it has a fighting chance. 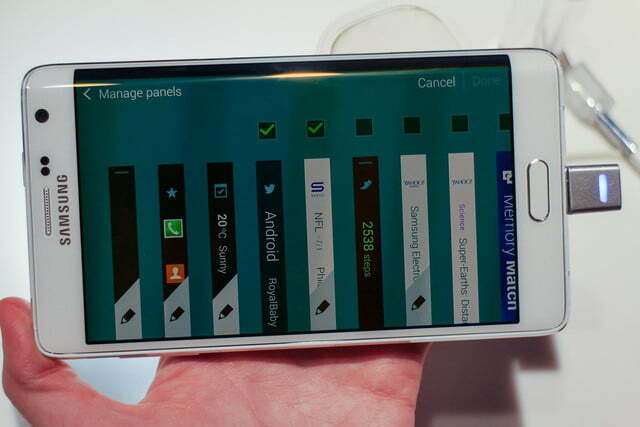 Considering just about every spec matches that of the Galaxy Note 4. The Edge has a 5.6 inch AMOLED screen, (the Note 4 is 5.7 inches), slightly shorter battery life, and a 64 GB option (the note is offered with 32 GB ). What’s more is the 2.7GHz quad-core Snapdragon 801 and 3GB of RAM pretty much guarantees that the device will yield a snappy device. The enduring success of the device is in the hands of developers. Samsung has released a software development kit specifically for the panel. But there are already some nifty uses (including a ruler and alarm clock) in addition to the Note Edge’s ability to reduce on-screen clutter. But it has yet to be seen if developers can create any real utility for the edge. The side screen comes with it’s own set of apps, one of which is a ruler that appears at the touch of a button. You can toggle between inches and centimeters. The curve makes it easy to line up against anything small that needs measuring. 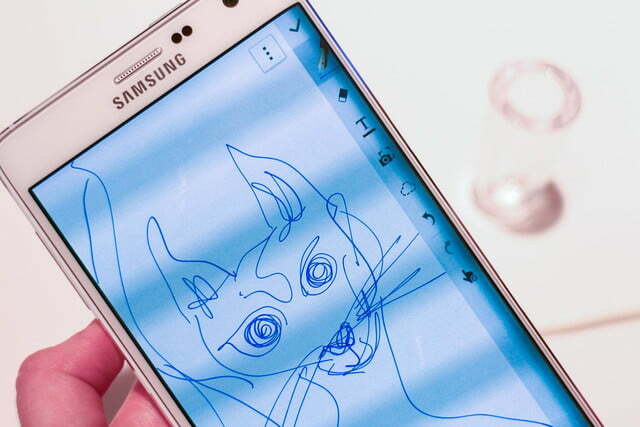 The Galaxy Note Edge is cool but not too cool for a stylus, specifically the S Pen Stylus. it works like normal on the main screen, but can even be used to rearrange or open apps on the curved screen. Samsung doesn’t want you to have to give up precision for two screens. You can put your mark on every part of this phone. You can change the wallpaper on the main screen and the curved screen. You can put your dog on the big one and a waterfall on the curved one, whatever you like, it’s your world, Samsung is just enhancing it. When you set your alarm for the night, the time will be displayed on the curved screen, so you don’t have to lift your head from the pillow to check it. Save that energy for when you actually have to leave bed. Unlike the ill-fated Samsung’s Galaxy Round from last year, the Galaxy Note Edge will be available on all four major American carriers. Release is expected sometime later this year, though no word on price. 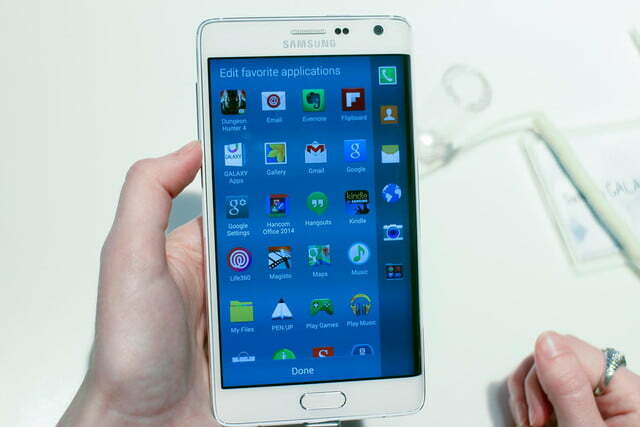 Samsung has marketed the Edge as the premium sibling of the Galaxy Note 4. 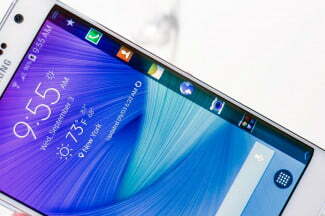 Judging by the initial high price of the Note 3, we expect the Note Edge to be seriously expensive . We’ll update when we hear word on price. 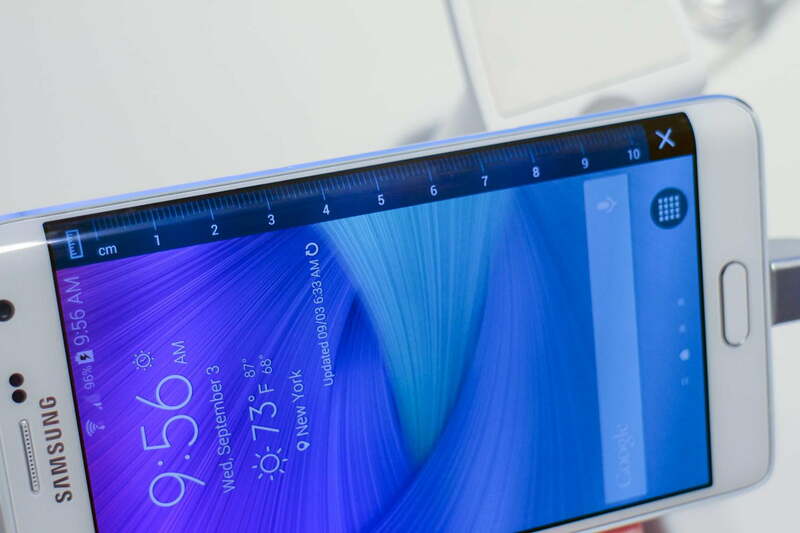 Could the Note Edge’s cascading screen be the future of phones?